What will pop in your mind when hearing the “Jet” term? If it’s very sharp shape, very fast, and lethal war vehicle, then you’re not the only one. Yes, it is right. Jet is very fast airplane with sharp shape and usually used as a war vehicle. Unfortunately, we’re not going to talk that kind of Jet. But, we’re going to talk about “another Jet”, which also has speed as the main attraction of course. So, there will be no sharp-shaped airplane vehicle for war coz we’re going to talk about “TransferJet”. Well apparently, this is not a familiar one, is it? 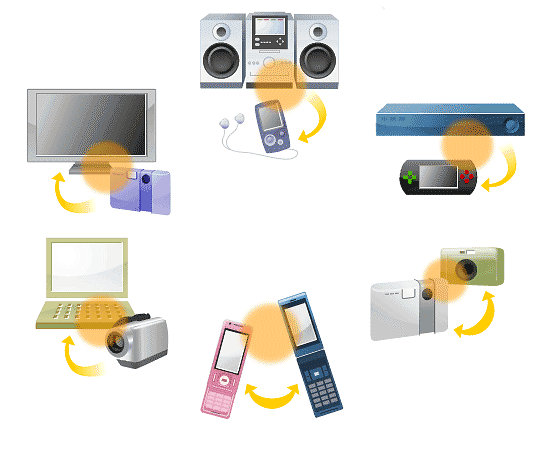 Or at least, it’s not as popular as other transferring technology such as Bluetooth, Wi-Fi, NFC, and others. So, for you who want to know more about this TransferJet technology, below is the humble explanation about it. The most notable thing from transferJet technology is that it is a wireless. And based on its name, which is “jet”, it must be featured with high level of speed. So simply, transferJet is a wireless technology that offers high level of speed in big capacity. This technology was the creation of one Japanese Electronic Giant, Sony. Firstly demonstrated in the early 2008, the idea of this technology was creating high speed data exchange between two touch-activated interface device by creating peer-to-peer connection mode. By the time, this wireless technology keeps improving its performance by creating even faster data transmission with bigger capacity. And so far, the peak transmission rate of transferJet through physical layer is 560 Mbit/s with 375 Mbit/s maximum throughputs. Surely, the most beneficial thing of using TransferJet technology is the high level of transfer speed it offers, which is 560 Mbit/s. Not only higher speed of transfer rate, but TransferJet also offers availability of transferring bigger capacity of data. More than that, this wireless technology is also able to adjust the rate during the data transferring process based on the environment. So, this wireless technology is able to maintain the stable and robust link during the data transfer process even if it happens in the middle of fluctuating wireless condition. For more detail information about TransferJet, please visit this wiki page. Next benefits of transferJet technology is regarding to the capability of filtering connection. Surely, it will be annoying when we are in the middle of crowd and some strangers try to connect to our device. To prevent this thing, transferJet is completed with the capability of doing filtering to several connections can be connected to our device, and several others which can not. To make this thing possible, Sony has developed TransferJet with capability to identify devices MAC address, so the user will be able to do the filtering system. In its operation, TransferJet technology employs similar frequency to UWB. But in its realization, this wireless only uses a section of UWB band. Moreover, TransferJet is also able to operate in the similar principle of UWB that has DAA functionality. This thing is possible since the power of RF it has is below -70 dBm/MHz. With such a low power it has, it will decrease the risk of interference between TransferJet and other wireless connection around. Besides the RF power which is getting decreased, the spatial of it is also shrunk down to only few centimeters. By this specification, Sony’s TransferJet no longer needs initial set up. So, when the device touch one to another, the data transfer will automatically triggered. For the new TransferJet system, it has completed TransferJet coupler. With TransferJet Coupler, you can achieve even higher transfer rate than when you are using the conventional antennas. This is because coupler will product longitudinal electric field, so the device can be aligned and there will be no polarization. That’s all about TransferJet technology. With the further research, this technology will be the potential one for the future. Whatever it is, we believe this technology will be able to contribute for the development of advance data transferring system.